Yesterday, Ozawa Ichiro dropped by the Foreign Correspondents' Club and answered questions for two hours, an oddly languid bit of scheduling for a presumed ultimate political animal whose tiny, extremely unpopular party has five candidates running in district elections on Sunday. That the People's Life Party is expected to win zero seats may have something to do with Ozawa's willingness to spend some time with the foreign press, who as a group influence exactly zero Japanese voters. Long and far has been Ozawa's fall, from the man who in March 2009 was the presumed next prime minister to this, diffident, shrugging denouement. 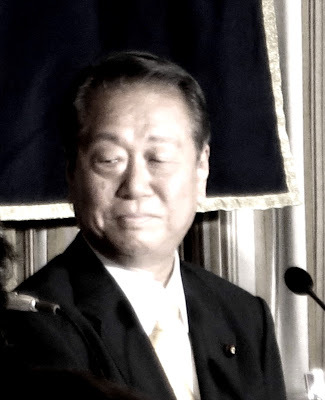 It is tempting to ascribe the collapse to The Establishment, the permanent-powers-that-be in this blessed land who found a way, through the corruption of the justice system, to knock out the political secretaries, present and former, of Ozawa on pretend crimes to first hobble and then smash the challenge Ozawa represented to the existing order. But it was clear from the answers Ozawa gave yesterday that a not insignificant part of his current diminution was self-inflicted. He was asked, after he had opined that the forces in opposition to Abe Shinzo and the Liberal Democratic Party had not had the time to work together to oppose the ruling coalition's message, whether he did not not find a fundamental disconnect between this complaint and his stage managing the breakout of his followers from the Democratic Party of Japan, deeply wounding the first party to in and of itself prevail against the LDP. Ozawa replied with gobbledygook about parties being filled with contesting voices. "Well they were," the voice inside my head said, "Until you either snuffed them out by disbanding the DPJ's Policy Research Council or took them out by having your followers leave the DPJ." To the follow-on question, "Do you now feel regret for having broken up and weakened the DPJ?" the self-confident Ozawa adopted a "I did what I did and I stand by what I did" tough guy stance, declaring, "If you look back over my record, you will see that I have no regrets for what I have done." "But Ozawa-san," the little voice in my head continued, "having regrets is what one should have, at least when one really messes up. Regrets are the instigators of caution and the search for better answers next time. Did you never hear the tale of the businessman, who after an injury to his brain, could not longer feel anger or sadness? After his convalescence, he tried to go back to work but was soon urged to quit because he felt no anxiety about the company's losing money, or, after the company had lost money due a bad decision he had made, regret over what he had done?" At the session, I also learned what it was that led so many otherwise level-headed folks to swoon when Ozawa would pay attention to them. He has an encyclopedic knowledge of policies, bills and platforms, making a conversation with him on matters of substance probably the most entertaining one a wonk can have with a major politician. Toss any policy-based ball in his direction and he will hit it out of the park. For the policy lover, Ozawa's interest must have been like an effervescent bath. That a superstructure for Ozawa's policies scarcely existed -- that at the end of the day nearly every position was tactical -- either cobbling together as coalition of convenience around a single topic or simply opposing the position of anyone holding more power than he -- was not apparent to Ozawa's allies until Ozawa was, like kuzu vines, in, around, on top of and all over their gardens. Ozawa goes into what his final battle this weekend. Yes, Seikatsu has 2 seats in House of Councillors not up for reelectoin and 7 seats in the House of Representatives. Imminent demise does not stalk the party like it stalks Fukushima Mizuho's Social Democrats (faint is their hope of survival -- another once mighty force facing the twilight). Nevertheless, a second, devastating defeat in a national election will bury the myth of Ozawa magic -- the seeming uncanny ability to read the electorate and pull victories from out of thin air. After a run of 20 years, the show will be over. Later - This post has been edited for increased clarity. This is a bit sad that he went from a prospected future Prime Minister to a member of an unpopular party without a real future. It is amazing to see how one influence can dominate the political world.